Automobile windshields provide a significant amount of strength to the structural support in the cabin of the car. For instance, in a front end collision the automobile windshield provides up to 45% of the structural integrity of the cabin of the vehicle and in a rollover, up to 60%. Your safety and satisfaction is our number one concern. Automobile windshields are an integral part of the safety of your vehicle. You should be able to rely on it just as you would your vehicle’s seat belt. An automobile windshield is the backstop for your airbags, if installed incorrectly or with substandard parts it could fail to protect you in an accident. We use only high quality parts keeping your vehicle in the same condition as when it was new. We use top quality urethane’s and the latest technologies to make sure that every install is safe, convenient, and reliable. 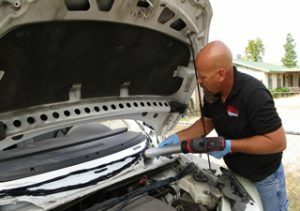 Finding a trained auto glass specialist is crucial to achieving a proper windshield replacement. At Glas Tek, you can count on your auto glass specialist to be properly trained, certified, and concerned about your safety. In addition, your professional auto glass specialist will go over all safe drive away times, warranties, and all automobile windshield care instructions with you when the job is completed. We use only high quality urethane’s that are safe, reliable, and have been crash tested to exceed rigorous federal safety standards. Why is this important? The urethane is the bonding agent between the automobile windshield and the pinch weld. If the bond fails, then your automobile windshield could come loose causing your life to become endangered. Additionally, we only use automobile windshield urethane’s that are fast drying to keep your safe drive away time to a minimum. The safe drive away time is approximately one to six hours in Phoenix, Arizona. Nitrile gloves are an industry standard. They are an important part to keeping your automobile windshield bond, free from contamination. All our auto glass specialists are required to wear nitrile gloves during a windshield replacement to keep your glass seal, free of oils that can cause adhesive separation. Our auto glass specialists are aware of this zero tolerance policy and are educated on the importance of bond adhesion. Another integral part of automobile windshield replacement is assuring that any present rust is removed and all scratches are treated. Any scratches that go untreated can turn into rust on the pinch weld causing a break in the urethane seal. This break can cause the automobile windshields adhesion to fail upon impact, putting your life in danger. Our auto glass specialists are highly trained in proper adhesive products including all required primers to keep your pinch weld rust free.